To celebrate Vancouver Pride Week (July 30 – August 5), a number of bartenders have put together some colourful and creative cocktails. 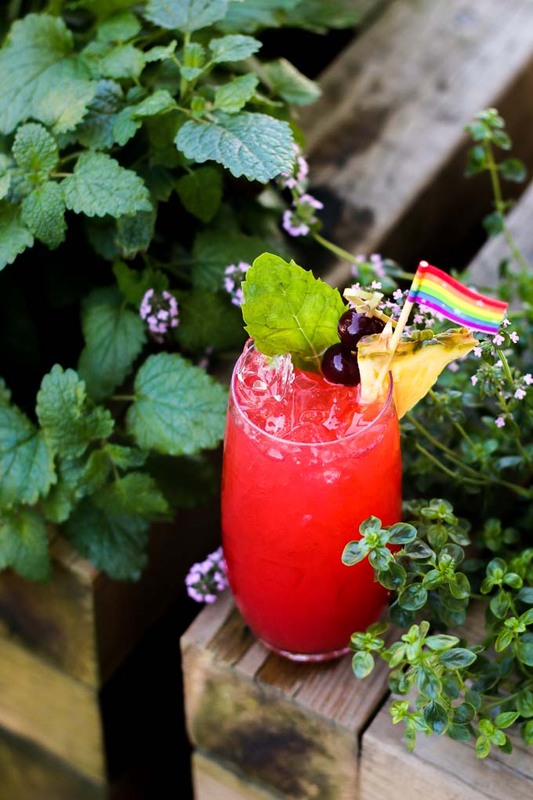 Check out these Pride cocktails and recipes. Inspired by Disney’s Aladdin, this brightly hued summer cocktail is so enchanting that some may think it was poured straight from a Genie’s magical lamp. 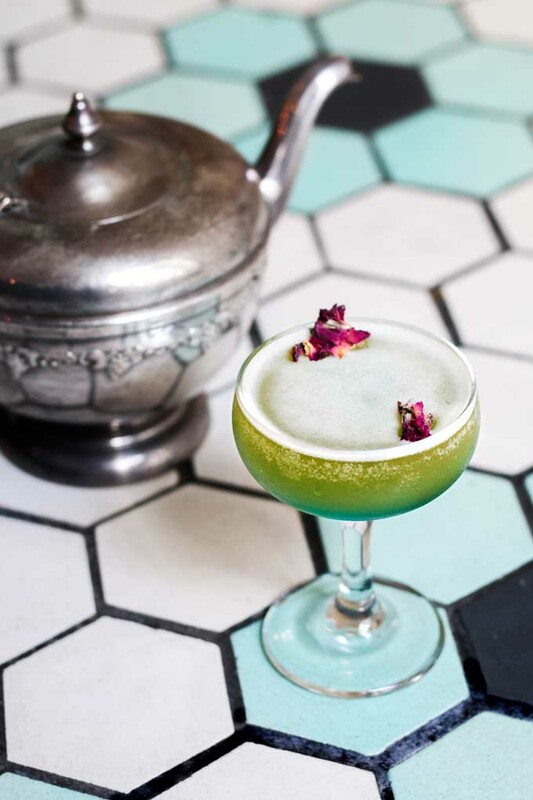 Cafe Medina Bar Manager Marc Slingsby-Jones has created a fruity and flavourful libation that blends Jasmine-infused vodka, lychee liqueur, poached pear, Blue Curaçao and fresh lemon. The eye-catching tipple is topped with a dried rosebud for an added element of whimsy. A portion of the proceeds will be donated to the Dr. Peter AIDS Foundation. Add all ingredients except Blue Curacao into a cocktail shaker. Shake to combine and then strain into a coupe glass. Slowly add Blue Curaçao to the glass so that it sinks to the bottom. Float Rose bud on top of cocktail and serve. Named after the chart-topping song by pop icon Lady Gaga, ‘Love Game’ is a fresh and floral sipper that’ll have you ordering a second. 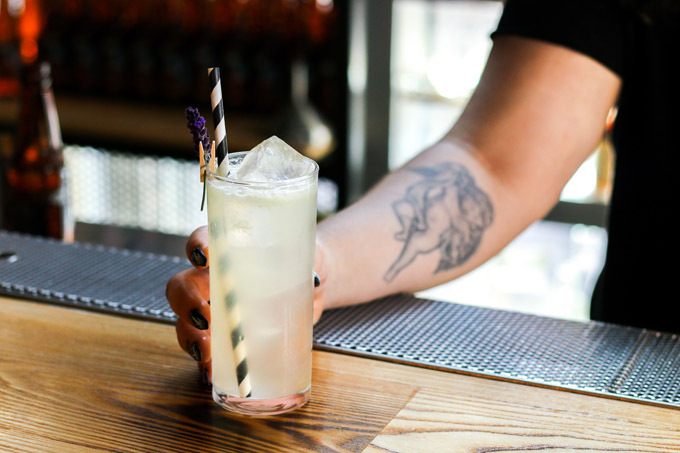 Juke Bar Manager Cass Darmanovic has some fun with this Pride-themed drink that offers a refreshing blend of gin, Lillet Blanc and fino sherry with muddled cucumber and lavender for an aromatic finish. In a cocktail shaker, muddle together two inches of cucumber and vanilla syrup. Add remaining ingredients to the shaker, excluding soda. Single strain over ice into a Collins glass. Top with soda and garnish with a fresh lavender sprig. Combine all ingredients in a 25oz pitcher and serve into individual glasses. 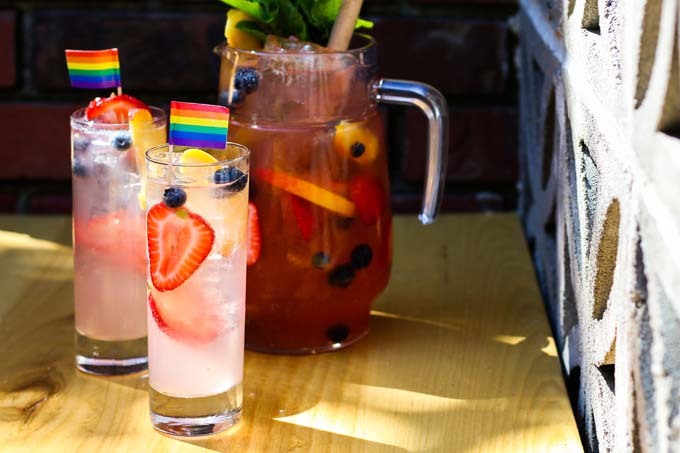 Tacofino’s ‘Ro-Slay Sangria’ ($8 glass, $24 pitchers) will be available from August 3 to 6 at both Gastown Taco Bar and Hastings location in honour of Vancouver’s Pride Week celebrations. $1 from each glass and $2 from each pitcher sold will be donated to QMUNITY a non-profit organization based in Vancouver, BC that works to improve queer, trans, and Two-Spirit lives. Sweet and summery, The Salted Vine’s ‘Raspberry Punch’ cocktail is the perfect bevy to cool you down following an afternoon in the great outdoors. From July 30 to August 5, 10% of the proceeds from each cocktail will be donated to Safe ‘n Sound, a Squamish-based non-profit organization that celebrates and honours lesbian, gay, bisexual, trans, queer + citizens, their families and allies, through awareness, education, visibility and resources. Shake and dump into Tom Collins glass. Garnish with pineapple slice skewered with cherry/mint sprig/grated nutmeg. 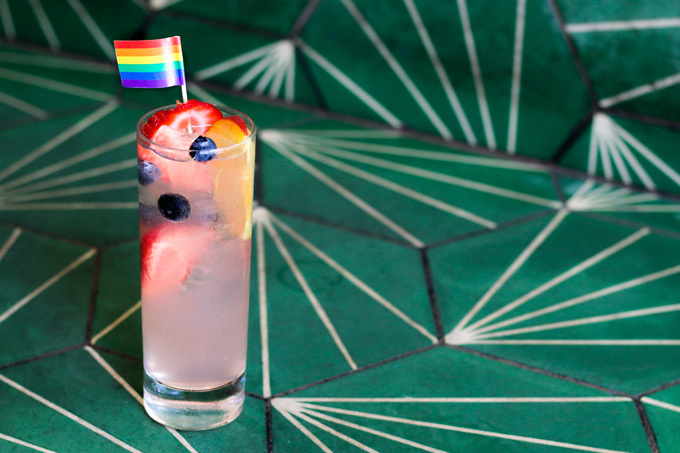 A cheeky riff on a classic cocktail, ‘Safe Word’ is the creation of Wildebeest bartender Drew McGuire who designed the playful drink in honour of Vancouver Pride Week. Much like the iconic ‘The Last Word’, this tasty libation features gin and green chartreuse but is updated with the addition of cherry brandy (rather than the traditional maraschino liqueur). 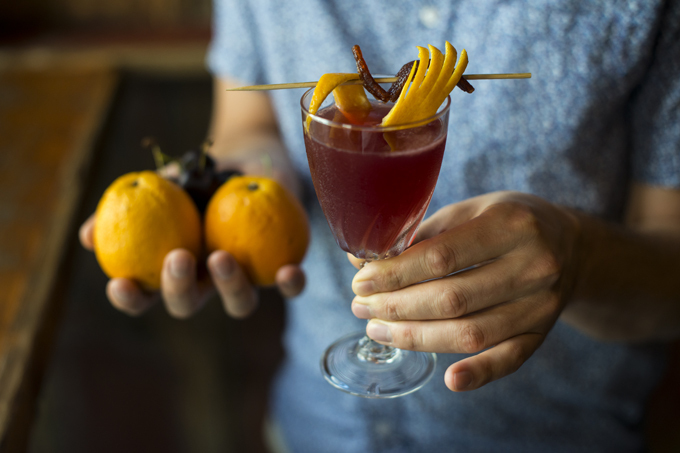 Garnished with a playful orange peel ‘whip’ and BC cherry fruit leather ‘bow’, this frisky Pride-themed beverage just the right amount of naughty. A portion of the proceeds from the cocktail will be donated to the Dr. Peter AIDS Foundation. Place ingredients in mixing glass, add ice and shake vigorously. Fine strain in chilled cocktail coupe glass. Garnish with orange peel ‘whip’, and BC cherry fruit leather ‘bow’.